It’s the usual love story, film noir style–boy meets girl at college, boy gets girl pregnant, boy tosses girl off a rooftop, making his murder look like suicide. So passes the first third or so of “A Kiss Before Dying” from 1956. Sure, a lot more happens during the first 30 minutes, but Robert Wagner (as Bud Corliss) is so stilted and wooden in the role that he makes the machinations he goes through to knock off his pregnant girlfriend seem boring and suspenseless. Joanne Woodward, as the girlfriend named Dorie Kingship (a pet name only the boyfriend uses), is forced into a terribly underwritten role, even by the standards of film noir leading ladies. Of course, Dorie’s in a non-win situation–it’s 1956, and you don’t have children out-of-wedlock (at least on film); you also don’t have a back-alley abortion (again, at least not on film). In addition, Dorie’s father is apparently such a jackass that he would cut her off entirely if she were to elope with her boyfriend, the only real out she has in a movie abiding by the Production Code. The problem of course, is that Bud doesn’t really give a damn about Dorie–he’s been researching her father’s company, Kingship Mining, and is after only her money. What Dorie sees in Bud is beyond me, since he merely fains interest in her most of the time–maybe it’s some stock Freudian message (so popular at mid-century) where she’s looking for someone like her father. After far too many contrived plot twists (most too boring to be described) as Bud is trying to eliminate Dorie, he finally lures her to the roof the municipal building on the morning they are to be married, a marriage to be attended by only the bride and groom, since she hasn’t even told her friends and family about the relationship with Bud. She blithely walks over to the the ledge of the 20 story building, and Bud tosses her off it like a rag doll. Since, through yet another plot contrivance that strains credulity, Bud effectively got Dorie to pen a letter that could be read as a suicide note, he’s off the hook. The action moves forward several months, and we see Dorie’s sister, Ellen (played by Virginia Leith) and her father (played by George Macready). Ellen receives a letter from one of Dorie’s sorority sisters, which mentioned that Dorie had borrowed an old, ill-matched belt on the day of her death. Suddenly, Ellen, who doubted that her sister committed suicide from the beginning (and who is apparently a good deal brighter than her sister), begins to suspect that Dorie was getting married that day (borrowed belt, old tattered blouse, new gloves, a blue ribbon on her handbag), and hence unlikely to kill herself. Ever his charming self, dear old Dad tells her not to bother, and to concentrate on the relationship with her new boyfriend (one guess here as to who her new boy-toy is). Nonetheless, Ellen heads to Dorie’s college to play Nancy Drew. She’s being helped Gordon Grant. He’s another bizarre and semi-credible plot contrivance; he was Dorie’s math tutor, but his uncle is chief of police, and sometimes does some investigations for the men in blue. He’s the only math tutor I’ve ever heard of who keeps a desk in the precinct house. At any rate, Ellen arrives at the college, has the register break a long list of privacy laws, and finds the man that Dorie dated for a few weeks before Bud (seemed like a popular girl). Through her bumbling, she gets him killed, but not before his murderer (again, one guess as to who it is) types yet another fake suicide note, saying that he felt guilty for killing Dorie. Feeling like she’s solved the mystery, Ellen returns home and is finally at peace with the situation. She promptly agrees to marry her boyfriend, who is revealed to be (please prepare yourself for a shock) Bud Corliss. It’s at this point that Ellen becomes as clueless as Dorie was–perhaps jackassedness is a general genetic trait of the family. Grant arrives to reveal that the man that Bud killed (and disguised as a suicide) couldn’t have killed Dorie–he was playing with a band in, I kid you not, Mexico City that week. Grant also reveals that he thinks that Bud went to college with Dorie, a fact Bud neglected to tell either of the two remaining Kingships. Being madly in love with a man who’s both deadly dull and a psychopathic murderer, Ellen of course refuses to believe Grant, and decides to take Bud on a tour of the family mine the next day. After a not-very-suspenseful interlude, Bud slips up and Ellen regains some semblance of intelligence. From there, it’s all down hill for Bud, who soon meets his downfall. (Please excuse the cheap metaphorical puns; it fits with the general mood of the movie). GACK! Watch it once, and then put it away forever. In case you couldn’t tell from the review, I think that there are many, many better film noir out there to enjoy. 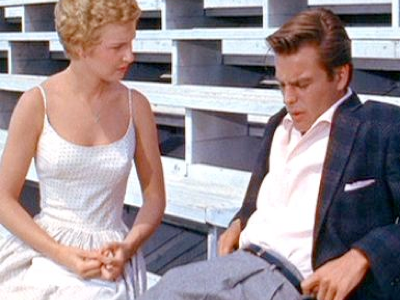 The basic problem with the film, though, is that it seemed like the studio was trying to make a movie that would appeal to both young men (come see a crazed killer) and their dates (stare dreamily at Robert Wagner). Needless to say, it was a flabby mess, and a script that seemed like it was put together in a day certainly doesn’t help quality. The most redeeming quality of the film is that you can watch it and see how far Robert Wagner has come: from two-bit actor in a third rate movie to Number 2 in Doctor Evil’s criminal syndicate.